During the last couple of weeks, I’ve had the pleasure of sampling two seriously good CBD vape juice lines. The first was Nature’s Script and the second is the focus of this review: Hemp BOMBS. I say, pleasure because using both of these CBD E Juices has been just that: awesomely pleasant. During this period, I pretty much ditched my usual, daily vape juice (Deep Cuts for the last month or so) in favor of CBD-infused E Juice. Right… let’s dig into the nitty gritty! Hemp Bombs – Is It A Legit Company? Founded in 2016, Hemp Bombs has grown massively during the past few years, gradually racketing up its market share. It ain’t the biggest but it is one of my new favorite CBD brands operating right now. 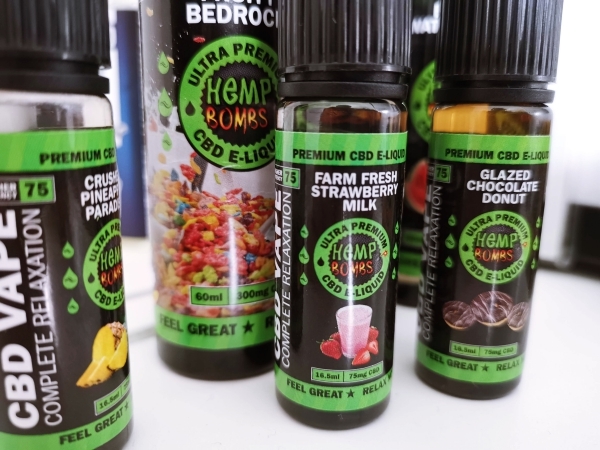 The company focuses on quality and flavor – whether you’re talking about its CBD gummies, its CDB syrup, its CBD oil, and, in the case of this post, it’s CBD E Juice. As you can see above: Hemp Bombs sell A LOT of CBD products, which can be confusing. But today we’re just talking about its E Juice (the CBD-infused E Juice). There are tons more benefits associated with CBD but I won’t bore you with the details. Instead, let’s move on to why I dig Hemp Bombs’ E Juice so much. I like dripping. Or squonking. I also like RTAs. Basically, I’m a rebuildable tank kinda guy. And when you like these kinds of tanks – RDAs, RTAs – you need E Juice with high VG content. I tend to use it, sporadically, in my drippers. This way I save E Juice – it’s pretty pricey, after all – and use it only when I need it. Hangovers, headaches, feeling achy, after the gym, or when I’m stressed. With Hemp Bombs, you got plenty of products to choose from but, on top of that, you also have plenty of strength options to pick from as well. And when I say strength, I mean the CBD concentration. All the samples they sent me are 300mg, which is perfect for me as that is what I normally go for. If you want something stronger, they cater right the way up to 4000mg – ideal for anyone with chronic pain issues. Obviously, the higher the concentration of the CBD the higher the price; a 300MG 60ml bottle will set you back $49.99, whereas a 4000mg one retails for $299.99! I only got a select few options through, but the ones I tasted were utterly fantastic. I think Watermelon Kush and Bangin’ Fruity Bedrock were my two favorites, though your preference might be different. Either way, the main thing is that there are enough flavors for all palette types. The flavors are mightily impressive too, easily as good as my normal, go-to high-quality E Juice brands. And if you’re using it inside a dripper, you’ll get 100% of the flavor right off the bat. I 100% recommend doing this, as the difference between this and a sub-ohm tank is like night and day! 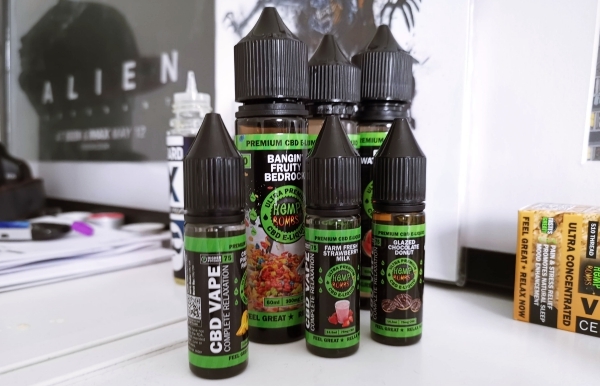 Verdict – Is Hemp Bombs CBD E Juice Worth A Buy? Hell yes! I really, really like this stuff. The flavors are incredible and the CBD is pure – two things you 100% want when dealing with CBD products. It vapes great in all styles of tanks, though I personally prefer to use it inside rebuildable tanks, so I get the maximum flavor possible. It is kind of pricey, but all high-quality CBD products are. This is a fact of life when dealing with these kinds of products, especially when they’re ethically sourced like Hemp Bombs is. 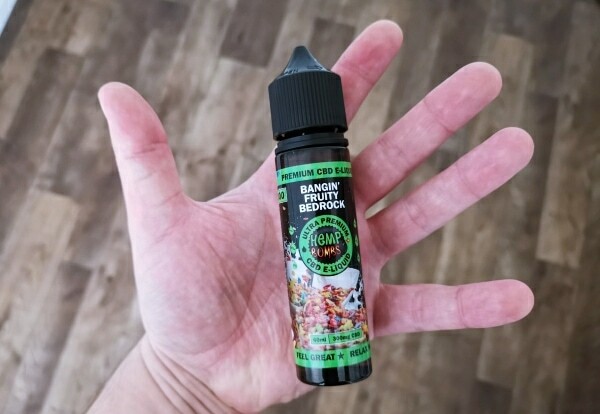 Hemp Bombs CBD vape juice does not contain nicotine. You can add your own if you wish, however. I did this because I liked it so much I wanted to use it all the time. If you’re more focused on using this as a supplement, you won’t need nicotine. Just add a bit to your dripper whenever you need it and you’ll get all the benefits of CBD. This will save you money as well, as you won’t be vaping it ALL the time. View Hemp Bomb E Juice!